The Colorex Manga set contains 10 specially selected assorted colours. Colorex is a dye based 'watercolour ink' that can either provide a brilliant, opaque colour or can be diluted with water for a more delicate wash of colour, much like a watercolour paint. The highly concentrated Colorex brilliant watercolour ink withstands heavy dilution in water. Pure or diluted, it can be applied with different tools: airbrush, brush, pen etc. and on various surfaces such as paper, Bristol board and canvas boards. The totally opaque white, brightens the different colours and lets you extend the range to use with pastels. Like all inks, Colorex is sensitive to ultraviolet rays. To avoid the excessive fading of colour over time, illustrations can be protected using a UV absorbent varnish. Due to the opacity of the colour when undiluted, it can be used on dark paper to great effect. Also suitable for dip pens and quills for use in calligraphy. Bottles include a dropper in the lid, for easy and clean application. 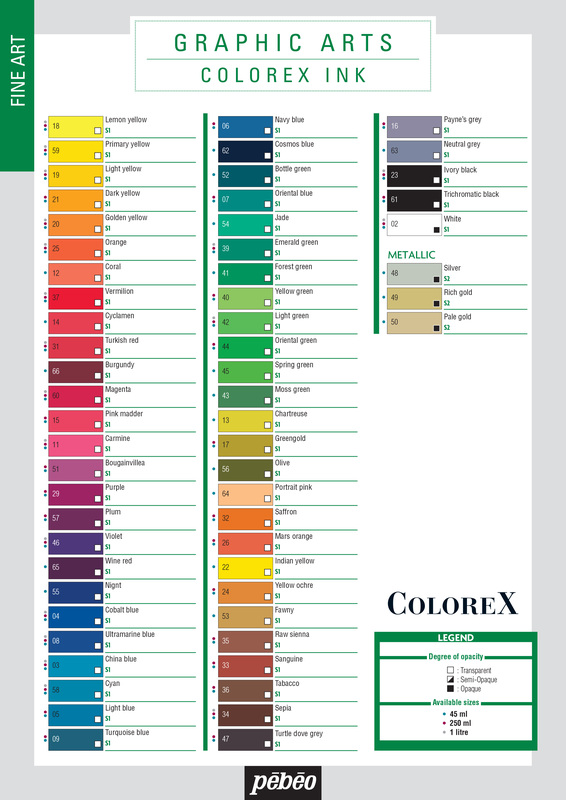 Set includes - 10 x 20ml inks in colours 02 White 59 Primary Yellow 37 Vermilion 60 Magenta 29 Purple 58 Cyan 45 Spring Green 26 Mars Orange 35 Raw Sienna and 23 Ivory Black. Also included 3 x plastic pipettes / droppers.